In our house, no project, event or errand escapes procrastination. Ever. And so yesterday, I found myself at the local bookstore fifteen minutes before it closed on the night before the last day of school waiting in line to buy gift cards for my seven year old daughter's teachers. It was a long lineup, full of other procrastinators, and at a nearby table there was a lovely display of Ecojot notebooks. We have these notebooks all over our house. I just can't resist Carolyn Gavin's wonderful designs, so I bought a small one for each of the teachers on our list. 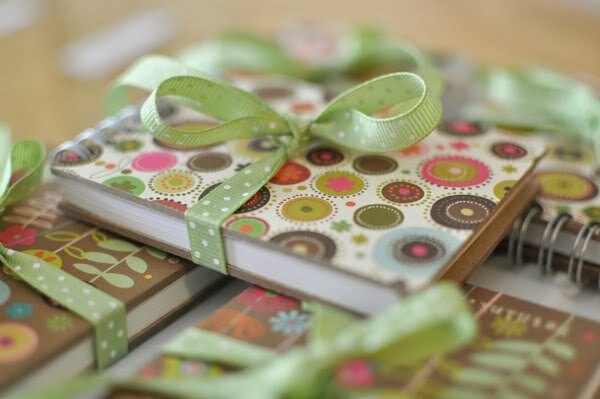 My daughter wrote a sweet note on the first page of each notebook and then we attached a gift card with a little tape to each of the inside covers. 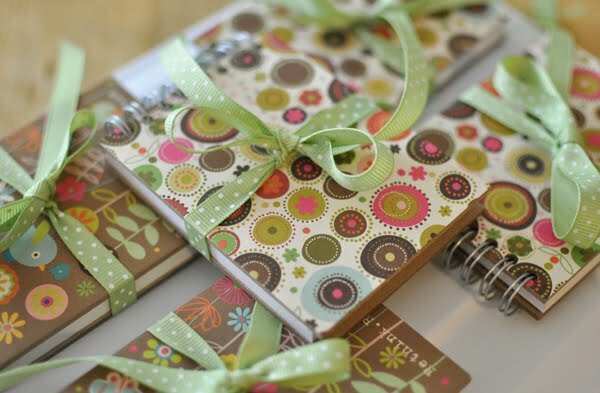 I wrapped them all with a green, polka dot ribbon et voila -- notebook, gift and thank you card all wrapped into one! I love ecojot! I have so many of their things and want so many more! They just recently came out with a heavy weight sketchbook but it's not in stores around here yet. I think your gift idea is wonderful - it's so nice when gifts are personalised like that! Thanks, Liberty! Ooh, can't wait to see the new sketchbook!